International trade in agricultural and food products is more complex than trade in manufacturing – trade regulations are stricter, paperwork is more cumbersome and logistics are more complex. These elements are mainly required for ensuring food safety for consumers. Detailed information on traded goods alongside the movement of goods in a supply chain is critically important for food safety. Various actors need to exchange information in the complex process of importing and exporting agrifood products. While there has been significant progress in the development of regulatory trade single windows to facilitate trade in goods in general, together with efforts to issue electronic sanitary and phytosanitary (SPS) certificates as well as to establish food traceability systems in some countries, these paperless systems may not fully meet the needs of the agriculture and food sector, where the requirement for accurate and timely information on products and their movements from farm to fork is becoming increasingly important to trade facilitation. 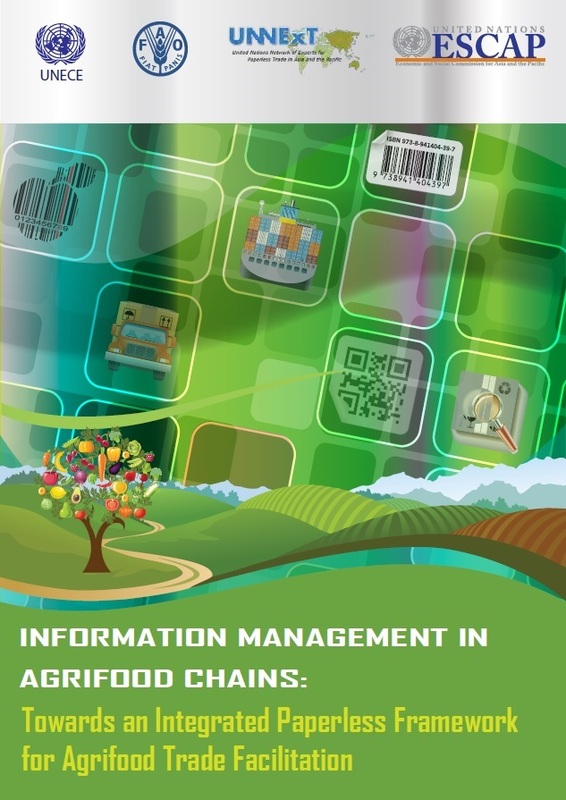 This publication outlines a framework for integrated agrifood information management, taking into account the functional needs of various stakeholders along the supply chain. The benefits as well as challenges involved in developing a comprehensive system are discussed. Some examples of existing paperless systems – which are considered good practices for agrifood trade – are also included together with the list of relevant international standards to be taken into account when implementing the systems. Practical recommendations for, and milestones in the enhancement of agrifood information systems for trade facilitation are provided, including a recommendation to develop a Single Window for Agrifood Trade (SWAT). This publication is aimed mainly at government officials involved in overseeing and making policies related to agrifood trade. It is also relevant to the private sector (both existing and potential traders), associations and any agrifood supply-chain stakeholders interested in making agrifood trade both safer and more efficient. This policy guide builds on the series of technical and legal guides produced by UNNExT to facilitate paperless trade implementation. All previous guides are available at http://unnext.unescap.org.